While there are many chicken breeds for children out there, I think some are better than others. We’ve had a lot of chickens on our farm over the years, and I believe some breeds are better for children. Although everyone has their own opinion, I’ve found that smaller and more colorful breeds are more attractive to small children. If one of your goals with raising chickens are to teach your children about animals and life lessons, starting with a breed that might interest them is one way to go. You also need to be sure that the breed will be safe and that your children will enjoy spending time with them. In this episode of What The Cluck?! 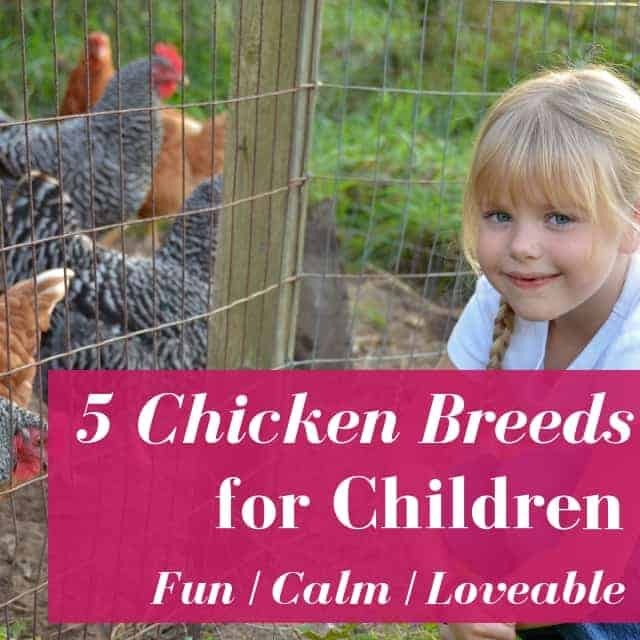 we talk about 5 chicken breeds for children as well as reasons to keep a flock when you have a family. Hi there, and welcome to session 15 of What the Cluck? !, a podcast devoted to keeping chickens for fun and self-sufficiency. I’m Maat from FrugalChicken, and in this episode we’ll talk about chicken breeds that are good choices if you have children, and advantages to keeping chickens if you have children. If you have children, or just wonder which breeds I recommend, you’ll love this episode. Just as a reminder, you can access this episodes show notes at TheFrugalChicken.com/podcast15 that’s podcast one five all one word. Now, over the years as we’ve had children, I’ve noticed that some breeds are better than others with small children. So, we’re only covering five breeds today, and this list is certainly not exhaustive. I had to trim it down for the sake of time, and I’ve chosen breeds that I have personal experience with, and that I’ve seen interact with children. I also tried to take into mind the things that are attractive to children, since part of raising chickens with children is to actively get children involved. I’m not a child development specialist, I’m a chicken expert, but I know from raising two small children that there are certain things that get them more excited than other things, and things that they’ll respond to better than others. I also tried to take temperament into consideration, and to choose breeds that aren’t known for being flighty or that are too antisocial. I also took size into consideration, because we keep all kinds of breeds on our homestead, and I noticed that our children respond better to young chickens and smaller breeds because they’re less intimidating, especially the roosters. So, that’s pretty much what’s reflected in my list of chicken breeds for children. Now the other thing I should mention is in this podcast, I’m using the term “breeds” loosely. Some of these breeds are hybrids, and purists will shout that they’re not really breeds because they’re not recognized by the American Poultry Association, and I get that. But until we come up with a different word in English for chicken breeds that are really hybrids, we’re going to continue to use the word breeds. Just wanted to get that out of the way. So, there are many breeds that work well with children, and I can’t for the sake of time discuss them all, so I’ve just included five. These are good breeds for children, and are reflective of my opinion. Your list might differ, but I think these five are a good starting point for someone wanting to bring chickens into their family that includes small children. First on my list of chicken breeds for children are Cornish Crosses. And these are not your typical pet chicken breed, and if you don’t know what they are, they’re large meat chickens, often referred to as “frankenchickens” because they’re bred to grow freakishly large very quickly. Now, if you hate Cornish Crosses or think they’re freaks of nature, just stay with me here. Cornish Crosses, because they’re bred to grow quickly, are quiet birds that don’t do much except lumber around. They do enjoy human company though, more so than other breeds I’ve owned, and they’re happy to just sit quietly with people. While they do have a tendency to die quicker than other breeds, if they’re well managed and not overfed, they can live quite a while. If you do decide to raise a Cornish cross, you need to remember they are not fully feathered and have a hard time regulating their own body temperature. So, they’re more susceptible to temperature extremes, unlike other breeds that are fully feathered and can regulate their temperature better. Cornish crosses do get quite large but they’re quiet birds and the roosters are placid giants that are not very territorial. We kept two Cornish crosses here as pet chickens, and both lost their lives to weather extremes, one to very hot weather and the other to weather that was too cold for her during tornado weather. But because they’re not flighty, Cornish Crosses typically won’t scare children, and don’t really run away when approached. Like I said, they tolerate being held better than other breeds, and especially if you want to use chickens as a natural sciences teaching tool, then Cornish crosses are a good option. They lay white eggs, and they lay much less frequently than other breeds. We had one hen that laid an egg every 3-4 days but her personality made up for the lack of egg laying. Next on my list of chicken breeds for children are polish bantams. We’ve had a couple of these birds over the years, both hens and roosters. READ NEXT: 10 ABNORMAL CHICKEN EGGS & WHAT YOU NEED TO KNOW! One of the reasons I personally like them is that they look funny and have tufts of feathers on their heads that look like a puff ball. They’re eye catching, and I think because of that, and also because they look like cartoon characters, children can relate to them. Our children liked them because they look like cartoon characters, and they’re placid, easy to get along with birds that don’t grow too big. They’re bantams, but our rooster did grow to the size of a large breed hen, he was about the same size as our rhode island red hens, but he wasn’t territorial and didn’t ever make a move to attack us. He just did his thing and minded his own business. Polish bantams come in a variety of colors, our rooster was mostly black with red tipped feathers, and of course his pom-pom on the top of his head was black with red tipped feathers. Polish bantams are not really excitable birds, I’m sure given the right circumstance they would be, but for the most part, movement didn’t bother them, which is good for small children because they tend to make sudden movements. Our Blue Copper Marans hens, for example, run away from our children because the sudden movements make them uncomfortable. Polish bantams lay white eggs, and they’re good layers. Of course, the roosters don’t lay eggs, but they’re nice, easy to get along with birds that children love to watch. The third chicken breed on our list today of chicken breeds for children are silkies. Now, for full disclosure, we don’t currently have any Silkes, but I wanted to mention them largely for the same reason I mentioned Polish bantams which is that they’re comical to look at and they look a little like cartoon characters. To me, they look a bit like something out of a Dr. Seuss book. Now, at this time I want to address that you shouldn’t choose a chicken breed for your children just because they’re funny looking. I know I’ve mentioned that I like Polish Bantams and Silkies as a breed for children because they’re cute, but by and large, you should choose a chicken breed for children because they’re a good fit on your farm and your kids want to raise them. That being said, with this list, I’ve chosen breeds that I think are eye catching and that children can easily relate to. Since many people want to raise chickens as pets, or to teach their children about the world, or to teach them responsibility, choosing a breed that’s interesting to your children is the place to start. Of course, you should always take the well-being of your chickens and your kids into mind, since both are living, breathing organisms. Both chickens and children should be kept in a safe environment and cared for accordingly. So, getting back to Silkies. Their feathers are also fluffier and finer than other chicken feathers, so small children are attracted to how they feel, and since their feathers are similar to mammal hair, I think children can relate to them. Children also like soft things, such as soft stuffed animals, so the texture of Silkie feathers are more attractive to small children. There’s some debate out there about whether Silkies are a breed of bantam, and according to the American Poultry Association they’re considered a bantam breed. Out of all the chicken breeds, Silkies are best known for their even, friendly temperaments, and some silkies are even used as therapy chickens for special-needs children because they’re so good with people. One woman actually fought her city ordinances after she was made to get rid of her autistic son’s therapy chickens. She was told that she wasn’t allowed to have chickens, and would be fined $10,000 if she didn’t get rid of them. But when her son’s health declined after the chickens were gone, she successfully got the city to alter the rules to allow her son’s therapy silkies, and was able to bring them back to her property. So, a bit of history about the breed. Silkies originated in China, and made their way over to Western cultures via the Silk Route as well as on merchant ships. Silkies were recognized officially by the Standard of Perfection in 1874. Unlike other chicken breeds, Silkies have 5 toes on their feet. They have all black skin, but their feathers can be different colors, including black, white, and buff. They’re fluffy creatures that like Polish Bantams, they have a tuft on their head. Silkies also have feathers on their feet, and overall, their appearance is more attractive to small children than other chicken breeds. One reason I mention silkies is because they’re small, adult males get around 4 pounds, so they not intimidating for children, and a good size for children to hold. Silkies roosters aren’t territorial so they’re less likely to attack your children. Silkie chickens lay white eggs, and although they don’t lay as well as other breeds, they tend to go broody easily, and they will hatch eggs other than their own, so some people keep them as live incubators. Of course, a lot of people keep them as companions, as well. The fourth breed on our list are Easter eggers, and largely that’s because they lay colored eggs, and I think kids are fascinated by this. While most chickens lay brown or white eggs, Easter Eggers can lay blue, green, and even pink eggs. We have one Easter Egger that lays pink eggs. I think kids get a kick out of the different colors, and it’s a little like Christmas or Easter every day for kids. Unlike other breeds we’ve talked about in this podcast, Easter Eggers lay frequently, ours lay just about every day, so there’s always eggs for the kids to look for. Easter Eggers are also effectively mixed breed birds, they’re a combination of chickens with the blue egg laying gene and other breeds, so they have hybrid vigor, and are generally healthy chickens to raise. Easter eggers grow to a good size, around 6 pounds, but we haven’t personally had any Easter Egger roosters that were territorial. But that being said, because they do get bigger, Easter Eggers can be intimidating for small children simply because they grow to be the same size as small children. Now one disadvantage of Easter Eggers is they’re more standoffish than other breeds we’ve discussed today, and generally don’t like to be held. So, if you’re looking for more of a lap chicken, then Silkies might be a better choice. Last on our list of chicken breeds for children breeds for children are Cuckoo marans, and in this case, I recommend the hens only. We’ll talk in a minute about why that is. As far as Cuckoo Marans hens go, we’ve had a few of them on the homestead, and they’ve been very friendly birds that enjoy human interaction. Ours would willingly be held, and as chicks, they would happily sit on our shoulders and take a snooze under my hair. They were never aggressive and seemed to really enjoy human company, as long as there no sudden loud noises. They’re a type of Marans, which are the dark brown egg layers. They’re also called chocolate egg layers. Cuckoo marans also lay eggs frequently, every other day or so depending on the season and their diet. Cuckoo marans are barred chickens, mostly black with white barring. I think children enjoy the color of Cuckoo marans. Like I said they’re more friendly birds than other breeds, and the ones we’ve had were willing to be held. They get larger than Silkies, for example, but the hens don’t get overwhelmingly large, 5 or so pounds. They have long, elegant-looking toes, and are just really nice birds to raise. Now one disadvantage of cuckoo marans is they can move quickly when they’re scared or intimidated, and although they’re more scared of us than we are of them, so to speak, for children who get overwhelmed easily, a cuckoo maran might not be the best choice. But like I said, cuckoo marans do enjoy human company, so if your child tends to be more in their head than you’d like them to be, cuckoo marans might help with that. Now let’s talk for a minute about why I don’t recommend Marans roosters and other breeds of Marans. I don’t recommend other breeds of Marans, we’ve had Black Copper and Blue Copper Marans here, and that’s because they tend to be flighty and run away from people. For children that want a pet or that are overwhelmed easily, they’re not the best idea. Other breeds of Marans tend to be standoffish, and they don’t seem to like interacting with people too much, unlike the Cuckoo Marans. I don’t recommend any Marans roosters in particular. We’ve had several Marans roosters here, both black copper and blue copper, and although we had a couple of exceptions, as a whole they were more territorial than the Marans hens and other roosters in general that we’ve had here on the homestead. Our one Blue Copper Marans rooster, Lavender, is a quiet guy that won’t hurt anything, but he’s not your average rooster. The other Marans roosters we have are quite territorial, and one in particular likes to come after people. This is good for a rooster who need to protect hens, but it’s not good for pet roosters, as it can frighten small children. For a while, our son was afraid of all chickens because this rooster would try to intimidate him by charging him, and this particular rooster has tried to charge me as well. He’s never actually flogged anyone and it’s more about bravado than actually trying to hurt anyone, but children can’t tell the difference, and are easily intimidated by roosters like this. The other rooster breeds we’ve had here have not been as territorial, and given the amount of Marans we’ve kept, I feel comfortable saying this is a breed trait. Marans also grow to be large. The males can weigh as much as 8 pounds, and the hens 6, so they can grow as large and as tall as a 1 year old human. My recommendation is to look at other breeds, or if you really want Marans, to keep them in a coop if they seem to present a problem for your children. And that’s not saying that every Marans out there will be territorial, but by and large in my experience, they tend towards it more than other breeds I’ve seen. So, let’s talk for a minute about why you might want to raise chicken breeds for children, and some of the advantages. Now again, I’m not a child development specialist, but I’ve noticed over the years that chickens are a gateway to teaching children about all sort of subjects, such as anatomy, natural sciences, and pretty much almost anything. I like to think with chickens you can use a Montessori approach to teaching, for example, if your child is fascinated by the eggs your hens lay, you can use that as a springboard to teach about anatomy, biology, math, reproduction, colors (if your chickens are all one color), you get the point. You can also use your chickens as a way to teach kids where their food comes from, and to have respect for the life that yields that food. With many people out there becoming more divorced from where their food comes from, there are people out there that don’t realize meat comes from animals, chickens are a healthy way to teach your kids where their food originates. Chickens are also a way to teach kids about custodial duty and how to care for other living beings. Having to care for a live animal, regardless of the time of day, temperature, weather, etc teaches life skills in a more meaningful way. I think it also shapes kids into productive adults. For example, someone I know, who now I wish I didn’t know, decided to throw a live rabbit he bought for his daughter to his dogs simply because he didn’t want to care for it anymore. What kind of lesson did that man teach his children? So, raising chickens is one way to teach your children to value life and to be responsible for other living beings. You can also use your chickens to teach about sharing. During the height of egg season, if you get more eggs than you can eat, giving them away to friends or family is one way to use chickens to teach your children that when they have too much of something, they can give it to someone who might not have any. Or, you might prefer to teach your children about business and industry. For example, if you decide to sell your eggs, you children can help you take care of the chickens, or if they’re older, they can help you calculate how much your spending on feed and housing, and how that effects the price you sell your eggs for and any potential profits. You get the point. You can also use your chickens to teach geography. For example, Silkies originated in China, and that’s a gateway to teaching about world cultures. They came to Western cultures via the Silk Trade route. That’s a way to start talking to kids about human history and how different cultures historically interacted. You can also teach US history, since breeds like Delawares originated in the US and are part of US history. Chickens are also a way to get your children involved with programs like 4H and FFA, which stands for Future Farmers of America. Both of these programs work to shape the personalities of children and to teach them responsibility. As an aside, FFA has scholarship programs and other opportunities available, perhaps 4H does as well, but I’m not as familiar with 4H. There’s many opportunities there, however, and I know chickens are a large part of FFA in our area. One teenager I got my Blue Copper Marans from in our area was breeding them as part of his FFA scholastic credit, so that right there is telling you something. And like I said, both of these programs work to instill values in children and teach them skills they might not learn otherwise. So, if you want to raise chicken breeds for children, but aren’t sure where to begin, you should first check your local ordinances to make sure you’re allowed to keep chickens. Each area is different, but a good place to start is City Hall, to see if you’re allowed to have chickens in your backyard. Nothing is worse than getting attached to them only to have to find new homes for them. Once you know you can have them, you’ll need to provide housing, so you’ll have to build or buy a coop. You can read one of my articles about how to build a coop at TheFrugalChicken.com/Tractor or you can buy one I recommend at TheFrugalChicken.com/Coop. Just remember that you need to provide 10 square feet of space per chicken if they will be cooped all the time or 4 square feet if they will be allowed to free range. They’ll also need feed and water. If you’re looking for a good book to help your children learn to raise chickens, head over to Pantry Paratus, which is an online homesteading store. There’s a wonderful book there called A Kid’s Guide To Keeping Chickens, which I highly recommend. It’s a step-by-step guide that kids can easily read to learn how to take care of their feathered friends. You can find that book at TheFrugalChicken.com/KidGuide, that’s K-I-D-G-U-I-D-E, all one word. Although I’m not an affiliate of Pantry Paratus, I talked to the owner, who is a wonderful woman named Chaya, and she agreed just for What The Cluck?! listeners to offer a special free shipping discount for orders over $100, and I think once you head over to the Pantry Paratus site, you’ll be super excited about all the awesome tools and books you’ll find over there. Right now their books are 10%-40% off in the “How-Tos & Why-Tos” section, so I know I’ll be stocking up on some of their books. So to use that free shipping opportunity, just use the code FrugalChicken, that’s F-R-U-G-A-L-C-H-I-C-K-E-N all one word. But you need to use it this month, because the coupon expires January 31. Of course, I’ll also put that information as well as a link to Pantry Paratus in the show notes, which you can view at TheFrugalChicken.com/podcast15, that’s podcast one five all one word. Well, I hope this podcast gives you a good idea of chicken breeds for children, and maybe it’s given you some ideas for breeds you can raise. I’d love to hear about your experiences with chicken breeds for children or even if you have questions, so there’s something I want you to do. I would love it if you dropped me a line at editor@thefrugalchicken.com. I do respond to every email I get. Now, if you have raise any chicken breeds for children, and you think their diet might be a problem, then you’ll be interested in my course Feeding Your Hens Right which comes out in January, which you can see at feedingyourhensright.com. 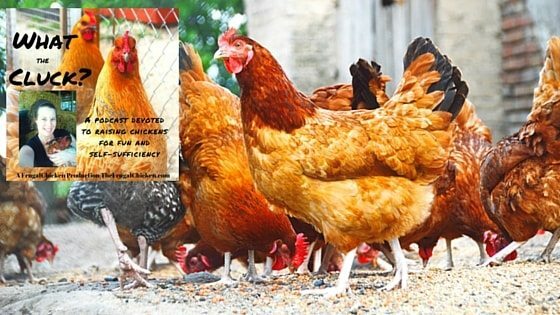 In this course, you’ll learn how to feed your chickens so they get an optimal diet, lead healthy happy lives, and lay the most nourishing eggs possible. Anyone who has a wheat allergy and can’t eat store bought eggs will understand what I mean. A friend recently told me that if she feeds her chickens a wheat based diet, her son, who is wheat intolerant, will get sick. So, that right there is proof that your hen’s diet does effect the quality of her eggs, and studies have shown the exact same thing. If feeding your family the most nutritious food possible is important to you, then you’ll want to check out my course. It’s 5 video workshops, that you can access at any time. There’s specific recipes for homemade feed that can be tailored to your particular needs, and you’ll learn how to raise a happy, healthy flock of chickens. Thanks for listening to this episode of What the Cluck?! about chicken breeds for children, and I’ll see you next time! There are some chicken breeds for children that are better than others. Here's 5 to get you started, and why they're great for kids. hehehehehehehe…. I love the title “What the Cluck!” Grew up on a chicken farm so these are fun to read/see.